A very handsome late Yongzheng/early Qianlong period Chinese export porcelain Dutch armorial dinner plate centered with the Arms of De Jonge, finely enameled and gilded, within a cavetto border and rim decoration of meticulously painted underglaze blue floral designs. Peony blossoms and butterflies are scattered about the rim on the reverse. The arms were borne by Cornelis de Jonge (1687-1743), a VOC official in Bengal, and also by his son Dr. Christian de Jonge (1730-1790). Measuring 9″ in diameter, and in good condition with the exception of a small rim line sealed. Circa 1735-1740.  Illustrated in Kroes’ Chinese Armorial Porcelain for the Dutch Market, page 198. An especially fine Chinese export porcelain 9″ armorial plate, made for the English market, centered with the very grand Arms of Hanbury in pretence with Comyn, this plate was part of a service ordered by prominent London Quaker merchant John Hanbury (1700-1758). According to Howard’s Chinese Armorial Porcelain, Vol. I, page 265, “This famous ‘Virginia Merchant’ was granted very considerable lands in Maryland and Virginia, and aroused animosity among his Quaker friends for permitting slavery on his estates”. Please note the exquisitely wrought gilded grapevine borders, virtually untouched from the day the service was unpacked on the East India docks! Yongzheng period, circa 1735. An especially lovely example of Chinese export porcelain made for the English market, this elegant 9″ plate is decorated in famille rose enamels with the arms of Napier of Ballikinrany. The design is centered with a quatrefoil reserve with a European town scene, the family arms rest on the bottom border, and their crest at the top, alternating with two charming scenes within rococo cartouches that are usually associated with the “Valentine pattern” depicting such romantic imagery as a pair of faithful dogs, and a pair doves resting upon Cupid’s quiver while a heart burns upon an altar of love. Very good condition with only a very minor line sealed. Illustrated in Howard’s Chinese Armorial Porcelain, Vol. I, page 320. Circa 1745. A fine example of this well-known Chinese export porcelain made for the English Market, bearing the Arms of Mertins impaling Peck, and finely rendered in early, Yongzheng period, famille rose enamels. Sir George Mertins was a Sheriff of Essex in 1705 and a Lord Mayor of London in 1725. His son, John Henry Mertins married one Elizabeth Peck in 1717 and it is most likely for that union that this service was ordered. The flamboyant armorial is centered within a gilded and iron red cell-work border with reserves of Daoist emblems; the outer rim border with meandering flowering vines and peony blossoms. Measuring 9 3/4″ in diameter, and in very fine condition with the exception of a star line to the glaze on the reverse. Illustrated in Howard’s Chinese Armorial Porcelain, Vol. I, page 213. Circa 1725. A especially fine rendition of a Chinese export armorial service special ordered for the English Market, this wonderful soup plate has an exuberantly painted full Arms of Pigot centering the design, surrounded with a gilded diaperwork cavetto and spearhead- bordered rim. The service was made for George Pigot of Patshull, Staffordshire, who became Governor of Fort St. George, Madras from 1755-63 and again in 1775-77 where he died under mysterious “confined” circumstances. He was created a baronet in 1764. 9″ in diameter. Excellent condition. Illustrated in Howard’s Chinese Armorial Porcelain, Vol. I, page 251. This rare armorial bears images of Portsmith on one side and the Pearl river on the other. In between these two is what was then called Madras. $2,850. C. 1795, from Mottahedeh Collection – see pg. 479 in “China for the West”.